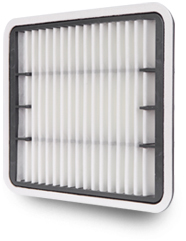 Our newest line of filters is a cabin filters called Vitamin Filters. The media is dipped in a vitamin solution which slowly releases vitamin nanometer scale capsules into the car cabin as humid air blows through the filter. These vitamin capsules are the same capsules that are used in cosmetics and are shown to moisturize your skin. We also provide a combined Vitamin/carbon filter type. 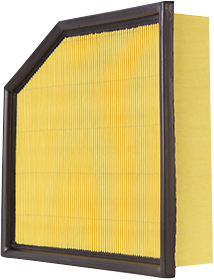 This combination filter is effective in removing pollen, road dust particles and stink. We are the only South Korean company authorized to export this type of filter. 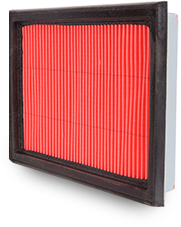 The air filter is designed to protect the engine from direct contamination by external pollutants. An engine’s air intake is between 200 and 500 m3 of air per hour, depending on its cubic capacity. The absorbed air is full of impurities depending on the climate, ground surface, level of atmospheric pollution, etc. In addition to these impurities there is dust, which if mixed into the engine oil, eventually becomes an abrasive paste, which severely damages the engine. The main purpose of the air filter is to remove harmful dirt particles from the air intake by introducing a filter medium between the air intake and the entry into the cylinder(s) in petrol engines prior to the carburetor. These filters can come in both panel and radial types. The frame of the panel type is composed of polyurethane. 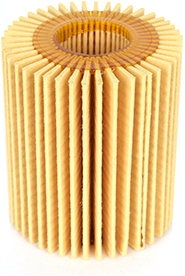 For the radial type air filter, both the top and bottom cap are formed from polyurethane. 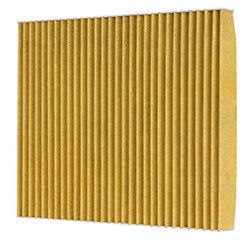 Most radial type filters will have a metal mesh lining in the inner circumference of the filter. Different media types can be used. 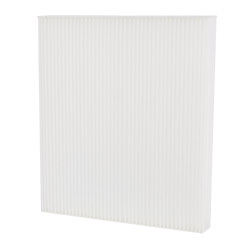 These filters are categorized by having a rigid plastic frame surrounding the media. They are available for both panel and radial style filters. They usually have a flexible plastic gasket surrounding the edge of the plastic frame. They sometimes are divided down the middle of the filter by a divider of rigid plastic. They are produced in both dry type and wet type. In the dry type, a cotton media is used. In the wet type, the filter media is composed of paper, which is sprayed with oil. This filter is made in both the dry and wet types. Some of the filters have a metal mesh lining. They can be radial or square in shape with a hollow center. The top and bottom caps are made out of steel. Some of the radial shaped steel cap filters have a rubber ring on the cap. Various types of media can be used to produce these filters. SJ AUTO’S HIGHLY EFFECTIVE CABIN AIR FILTERS remove more than 90% of all pollen and road dust particles entering into the car cabin without inhibiting the flow of fresh air. The cabin filter effectively reduces the film of dirt on the windscreen, thus improving night vision. Therefore all major car manufacturers currently produce cars with cabin air filters. To guarantee that the air in the interior is pure at all times, the filter needs to be replaced regularly. The concentration of dust in the atmosphere and the proportion of different types of poisonous particles in it result from the weather conditions and social demographic characteristics in each. SJ AUTO cabin air filters are made with a synthetic fiber media called NONWOVEN, which when properly pleated gives us the maximum filtration area, which guarantees an average retention rate of 90% of the poisonous particles, allowing us a markedly improved air quality in the cabin. SJ AUTO cabin air filters guarantee a retention rate of 100% of particles greater than 3 microns in diameter, for example plant pollen, and no less than 90% of particles 0.5 to 2 microns in diameter, like poisonous exhaust fumes, metallic particles, bacteria, fungi, etc. SJ AUTO also offers a variety of active carbon cabin filters, which have a layer of active carbon that retains the molecules of different gases, and stops them from reaching the driver. They are designed to removed particle matter or soot from the exhaust of an engine. This particle matter in the exhaust results from the incomplete combustion of the fuel. In previous years, particle filters were not widely used, but in more recent times tightening regulations on emission levels of vehicles have encouraged an increase in demand for these filters. These filters have two functions. The first function is the basic function of any filter, to remove particulates from the air. The second function is to remove gaseous impurities, which include harmful or odorous gases. These gases can be released into the cabin of the car, so it is important for this filter to be regularly maintained. Combination filters usually use carbon on the filter media. These filters contain a layer of carbon, and can filter out both particles and gases. The charcoal allows for the filtration of ozone well as pollen, fungi, bacteria, etc. These filters are mold-resistant as well. 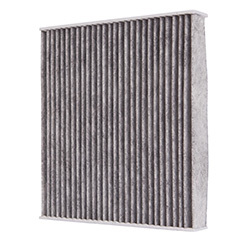 The charcoal in the filters is embedded in layers of non-woven material. These filters perform better than particle filters. ONE OF THE ESSENTIAL PREREQUISITES for the satisfactory operation of an internal-combustion engine is the continuous lubrication of the moving parts of the engine with oils which are kept at the required level of cleanliness to avoid any premature wear. The oil filter plays an essential part in this process because it provides continuous purification of the oil by retaining abrasive particles, caused by normal wear and tear, as well as dust and combustion residues. The oil pump, driven by the engine, aspirates the oil via a sieve (to prevent aspiration of large contaminants) from the oil sump and pumps it towards all the places that need lubrication. Oil filters can be designed as a ‘spin-on filter’ or as a ‘filter cartridge’ in housing. A ‘spin-on’ filter is completely replaced after its useful life, whereas only the filter inside the ‘filter cartridge’ housing needs to be replaced. The oil filter is a very advanced and high quality product which helps ensure that the vehicle will operate more efficiently. It consequently plays an essential part in engine performance as well as extending engine service life. This can only be achieved by replacing it at regular intervals, before the filter begins to be bypassed. Spin–on oil filters consist of a housing and a filter element inside the housing. The filter element is sealed inside the housing and cannot be removed, so the filter must be changed as a whole unit. 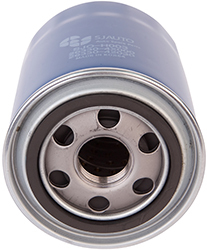 Although most oil filters may appear identical on the outside, they differ on the inside. They may or may not have anti-drain valves, the media may differ, the threads may be different, etc. Therefore care must be taken when changing the oil filter. 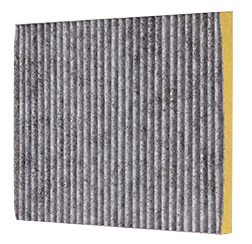 If the wrong filter is installed, engine damage may occur. The housing for the eco oil filter remains inside the vehicle. The filter material remains separate from the housing. When it is time to change the filter, only the filter media is changed. When disposing of the filter media, it can be incinerated, as it only consists of paper and environmentally friendly polymer, no solvents or glues are used to produce eco filters. This is a great environmental improvement over the conventional spin-on oil filters. common fuels for internal combustion engines. Contaminants (particles, water) arrive in the fuel in various ways. These contaminants can plug fuel injectors or carburetors, causing engine malfunction and deterioration. Dirt, rust, scale and water are the major impurities present in fuel. Therefore they must be removed from the fuel to avoid damage or malfunctions in the various components of the fuel system. A certain amount of additives have been added to diesel fuel to reduce the possibility of crystallization of the paraffin in the fuel (flocculation). In certain filters a heating element with a thermostat is present, thus avoiding flocculation temperatures. Once severe flocculation has occurred, oil filters must be replaced and the fuel lines must be cleaned. There are 2 types of injection fuel filters, the pipe type and the nut type. They both have a housing with a filter element inside, and two ends, an ‘in’ end and an ‘out’ end. For the pipe type, there is a small pipe extending from both ends of the filter. For the nut type there are nuts on each end, with threading on them. The filters are caulked shut, and the entire filter must be taken out and replaced. Emulsified and free water as well as fine particles must be separated from diesel fuel. This must happen before the fuel passes through the fuel injector system, since even a very tiny particle can block the fuel injection system. The water is removed from the fuel where it condenses into drops that drain from the filter. Some filters contain a drain, while other filters accumulate the filtered material at the bottom of the filter. CRDi engines use one common rail, or fuel line, to supply fuel to all the cylinders. The fuel is highly pressurized to allow it to combine with air more efficiently. By using one fuel line for all cylinders, it ensures that the fuel reaches all the cylinders at a uniform pressure. This high pressure is required for the pump and filter to work properly. 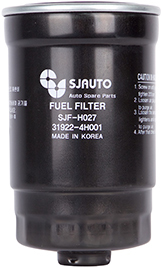 The filter has many high precision parts that distinguish it from regular fuel filters. Vehicles equipped with a CRDi system can only use CRDi filters. 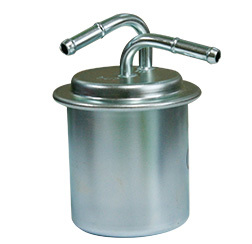 Eco fuel filters are made of environmentally friendly components that are easily disposed of. They are designed so that only the filter media needs to be exchanged, instead of the entire filter casing being removed and replaced. 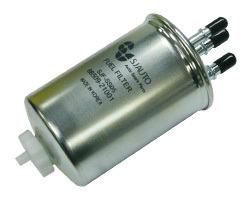 Eco fuel filters are being used more and more frequently in recent models of vehicles being produced.